Andrew Sherk of Fort Washington prepares for a luge trial run. PYEONGCHANG, South Korea — Imagine flying down a winding track of solid ice while wearing next to nothing. At over a hundred miles an hour. There are metal blades involved, too. And in some cases, you can't see the track you're barreling down. It's safe to say that it takes a special kind of person to be a luger. Not only do Andrew Sherk and Jayson Terdiman fit the bill, but they also do it at the most advanced level at tracks across the world. But before they were doubles members on separate sleds representing Team USA at the 2018 Winter Olympics, they sought out thrills at home in eastern Pennsylvania — Sherk in Fort Washington, and Terdiman in Berwick. "The two of them have always been the 'get-the-skateboards-going' guys and [did] gymnastics, [flipped] on the trampoline," Kathryn Terdiman, Jayson's mother, recalled. "Where a lot of kids would just spend their time video gaming, Jayson and Andrew were not those two kids." "I didn't know this," Ellen Sherk, Andrew's mother, said to Kathryn. "I didn't know it was a Jayson thing that instigated the fun stuff!" The two met in Lake Placid, N.Y. at the Olympic Training Center when Terdiman was 16 and Sherk was 12 while training with the USA Luge junior team. Camps lasted only a couple weeks at a time, but they were long enough for Terdiman and Sherk to develop a friendship. "We start out super young and it's like a family bond," said Terdiman, a Berwick High School graduate. "I'm an only child, he's an only child. Andrew's as close to a brother that I've ever had." Both Sherk and Terdiman are both bottom men on their sleds, which means they sit at the rear behind their partners and could never be paired together. The two positions are extremely different — the bottom man uses his shoulders to make the sled take on corners smoothly, while the top man uses his hands and legs to steer. So, the two use each other's experiences to improve their individual performances. "We both go through the same things," Sherk said. "Considering that we can't see anything going down the track, so we both know what it's like." This is the Upper Dublin High School graduate's first experience at the Olympics. He and his partner, Justin Krewson, qualified for the team by six hundredths of a second at a World Cup event in December. Both Terdiman and his companion, Matt Mortensen, raced in the Sochi Olympics, but on different doubles sleds. There, Terdiman finished 11th. 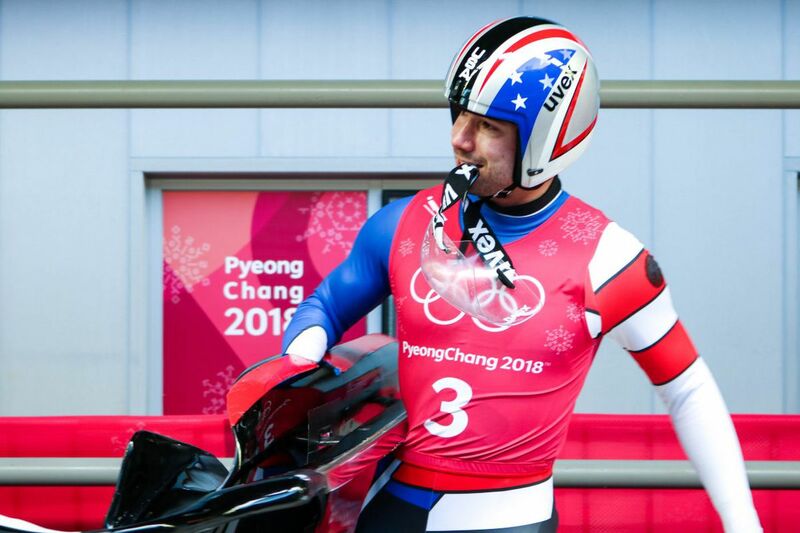 At the doubles luge official training runs a couple days before his second Olympic appearance, Terdiman said he knows how to frame his attitude for success. "We come from a small sport," Terdiman said. "There's a couple hundred people normally at a race for us and a few thousand watching at home. Now, we're gonna have a few thousand people at the track and millions watching on TV. Just staying out of your own mind is very important." It's that kind of knowledge Terdiman is willing to share with Sherk, even though they technically compete against each other. "In some countries, it's not like the United States," Kathryn Terdiman said. "They don't talk to each other or help each other. But our kids do that. They want to see them, each other, do well." Chris Mazdzer, who was Terdiman's doubles partner for a period of time in their junior careers, echoed a similar sentiment after he took silver in men's singles on Sunday. The historic second-place victory marked the first time an American man ever medaled in the event. "It's such a unique bond on the luge circuit. I don't know how to relate it," Mazdzer said. "At the end of the day, we all want to be the fastest. But we all want to see hard work, good starts, good sliding." The days filled with thrilling "roller luge" rides on longboards down hills in Lake Placid have passed, but Terdiman and Sherk aren't finished with their bold adventures. "You gain experiences with these people, things that most people don't ever do," Terdiman said. "Like going to Prague on a whim just for fun for a night. Getting to experience all that Germany has to offer, all that Austria, Italy, Latvia [have to offer]." Now, they get to add another special location to that list: Pyeongchang.